The Atlanta Home Inspector likes to share ways for you to maximize the value of your home. Some details are worth the overhaul of your home, while others aren’t as threatening and are more cosmetic in nature. Listed below are the actual return expectations on simple upgrades to your Canton home. Expected to reach a total volume in excess of millions this quarter, home improvement projects are booming. Unlike in recent years, however, the projects aren’t helping to create much new home equity. 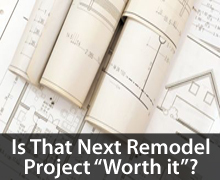 It is good to determine how much return you desire from your upgrades, before beginning the remodeling process. For each home improvement dollar spent in 2012, homeowners can expect to recoup just 58 cents in home equity according to the Cost vs Value Reports for 2011-2012 in Remodeling Magazine. This figure is down sharply from about 5 years ago. Today’s Canton homeowners get a much smaller payoff than in the past on their home improvement projects. If you’re planning to remodel/update in preparation for sale, therefore, consider the following projects, each of which carries a high cost-to-value ratio. By contrast, other projects carry a low cost-to-value ratio, and should only be undertaken if the project’s utility exceeds its cost. These projects don’t do much to raise a home’s resale value. In the “Upscale Projects” category, projects including the replacement of doors, siding and windows occupy the list’s first 6 slots in terms of cost-to-value. If you’re planning a home improvement project over the next few months, the timing is right — both contractor costs and material costs are low nationwide, and improving a home can extend its useful life. See the complete Cost vs Value report online.